The Duchess of Duke Street DVD collection. The complete collection on 10 dvd's. DELIVERED FREE IN THE UK. 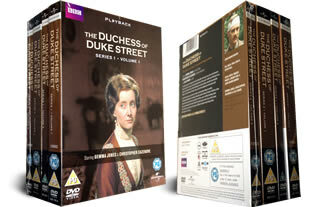 The complete series of the hit tv series Duchess of Duke Street. This is the classic BBC series following the young cook Louisa Leyton, and her rise to riches as she strives to become the best chef in the whole of England. Commonly purchased with our Poldark complete series dvd set. Re-released for 2012 this is a genuine UK region 2 dvd set. 10 dvd's in 2 box sets delivered to your door. I wanted this series for some time. I bought the series at first from another supplier which turned out to be from an EU country and one disc was defective. First time I bought from Classic Movie Store. Excellent service from CMS and it is great to see this wonderful and well acted series from the past. On of TV's greats I wish similar programmes were made now. Although the series was first shown in the 1970's I could remember some parts of the episodes. The playback and audio is still crisp and sharp. Good acting from all the cast with realistic story lines and excellent costumes worn depicting the times of the early 1900's. My favourite costume drama. A stellar performance in the lead role by Gemma Jones. If you like The Oneidin Line; Upstairs Downstairs or Downton Abbey, treat yourself to this classic 70's series. Excellent buy, really good sevice, quick delivery and well packaged. I am watching it at the moment, a thoroughly good series. Excellent Period Drama which I am now half way through watching. 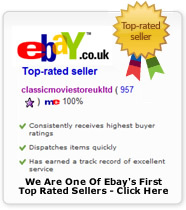 Classic Movie Store prices are exceptional value for money and I have not found anywhere else cheaper for box sets. Have always received orders very quickly. Will definitely continue to purchase from them.